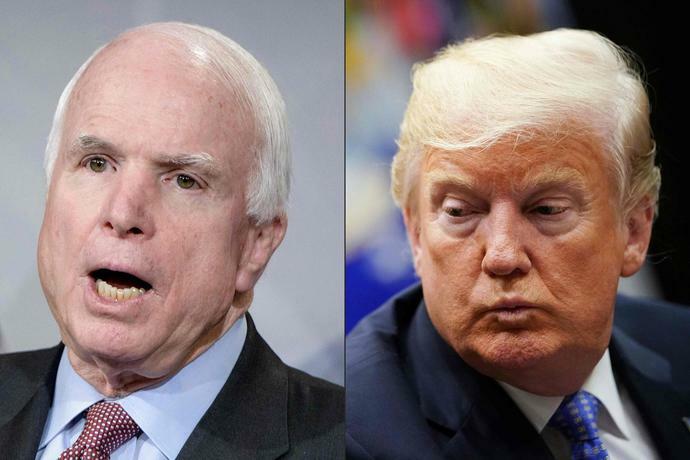 WASHINGTON - President Donald Trump defended his ongoing attacks on the late Sen. John McCain Tuesday, saying he never liked the Arizona senator over differences that included Russia and health care. "I was never a fan of John McCain and I never will be," Trump told reporters at the White House, answering a question before a meeting with Brazilian President Jair Bolsonaro. McCain supporters pointed out that Trump was incorrect about the late senator's class standing - he finished fifth from the bottom at the Naval Academy, something he joked about frequently. They also called the attacks disrespectful to the longtime senator, veteran and former prisoner of war.